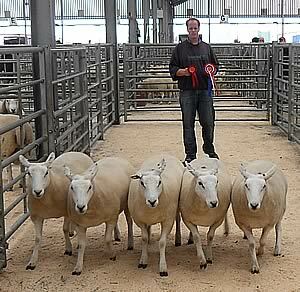 There was a buzz in Stirling on Monday when demand for both Lleyn females and rams soared. 100% of the shearling gimmers sold and hit an average of £185.97, up £43.52 on the year. Ewe lambs had the greatest improvement averaging £107.69 up a huge £46.75 on the year. The female top price was £260 for shearling gimmers and it was realised three times. Firstly JK Goldie, South Bower Houses hit the top spot with his second prize ewes selling to RL Morris & Partners, Blairgowrie. Finlay McGowan, Incheoch was next to hit £260 twice selling to J & C Grant, Caithness and RL Morris & Partners. The champion females from Hamish Goldie were not far behind realising £250 to Stuart MacMillan, Isle of Islay. Hamish Goldie had a good day also topping the ewe lamb section at £150 to RL Morris & Partners. The first prize pen from Farmstock Genetics of Selkirk sold for £145/head to C Gammage, Lanark. There were plenty of buyers for rams also, with very few returning home. Michael Cursiter for Laga Farms Ltd, Orkney topped the sale at 1300gns with the first shearling ram into the ring. 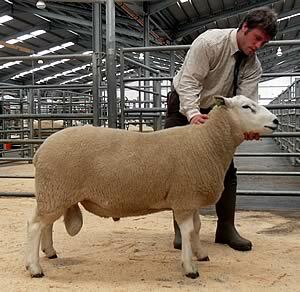 Bred by a homebred ram, he sold to Gordon Munro of Shetland. Farmstock Genetics hit the 1000gn mark with the champion bred from a homebred sire and also selling to Gordon Munro.